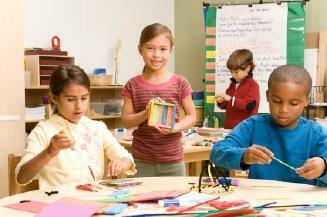 In every art classroom health and safety issues and practices are important concerns for teachers, parents and students. When you think of art classrooms, you most likely think of students' busy drawing, painting or working with clay. It is a classroom where creativity and learning take place. However, it can also be a room where safety hazards exist and students' health can be compromised. Many times the dangers that exist in an art class are overlooked since they may not be as apparent as those of other types of classrooms such as science rooms or labs. However, from elementary school through college, there are art rooms that contain materials or substances that are toxic or carcinogenic. Dangerous conditions exist and unsafe practices take place, often without anyone realizing the possible outcome. Students should not wear loose-fitting clothing or dangling jewelry; they should keep their hair tied back if they are working on a potter's wheel or operating a power tool. Teachers should not mix dried materials or fire a kiln when students are in the classroom, as this exposes them to hazardous fumes and dust. Make sure each student knows the rules of safety and follows them. Only use materials that are safe for children to use. Make sure to read the labels. Give preschool and kindergarten children small amounts of art materials at one time. This reduces the amount of material they can put into their mouth. Hang decorative safety slogans around the classroom to remind everyone to follow the rules. A list of arts and crafts materials that have been deemed as health hazards has been issued by The Office of Environmental Health and Hazard Assessment, known as the OEHHA, of the state of California. In that state the items on the list cannot be purchased for use in schools for grades K through 6. The list contains hundreds of products. The OEHHA also provides guidelines on using products for arts and crafts safely and recommendations for safe substitutions for materials that should be avoided. Putting good art classroom health and safety practices into effect will reduce the number of illnesses, accidents and injuries that occur each year.